Rural farmers in central Kenya have been piloting a project, called DrumNet, that provides marketing, financial services and information to them using their mobile phones. The project’s premise is that information on the market is one of the key elements that keeps farmers from getting the full market value for their products. This lack of information also keeps the farmers in a disadvantageous financial position, so that it is difficult to get the financing and resources they need to grow their business. DrumNet is currently moving from the pilot project in central Kenya to a beta phase project in western Kenya. The pilot phase was research on whether or not the concept of providing marketing, finance and information with the aid of cell phones was feasible. It was concluded that it was and they are now moving into a beta phase. For this next phase DrumNet has around 250 participating farmers planting around 150 acres of sunflower. They have not completed a full cycle with the current model, but since sunflower growing season is only 3 – 4 months they should see results fairly quickly. DrumNet is part of Pride Africa, a US-based organization that has successfully implemented micro-enterprise urban loans for short-term capital in East and Southern Africa. With projects in Kenya, Tanzania, Uganda, Zambia and Malawi, Pride Africa has proven to be an economic development group that works. They work to create products that have a financial impact on the community and which can be taken over and run privately after they have been setup. The application that is being written, is Java with a Postgres database utilizing a commercial SMS gateway out of South Africa. DrumNet is trying to write it so that it is extremely simple to use. From the farmers perspective they are initiating an SMS to them where they ask a question looking for a simple answer. Many of the SMS’s only require a Yes | No | or Call response, probably a 1, 2, or 3. Some are more complex, like “How many acres has your group planted?”. Another main goal of the system is to create a cashless system that allows DrumNet to track where inputs are going, who is getting inputs and how much produce is expected at the end of the growing season. This will hopefully cut down on side selling, selling of bad fertilizers and seeds, etc. The farmer will receive a unique e-token on their phone. When they go into the stockist they give the stockist the e-token and s/he sends it into the DrumNet system. The DrumNet system immediately affects payment to the stockist. 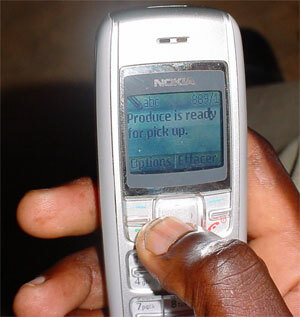 The DrumNet system in turns sends a confirmation SMS to the farmer making sure that the he did indeed pick up the inputs. They are also trying to create a system so that when the transporter picks up the graded harvest at the end of the growing season, the transporter can SMS in the amount picked up. This will kick off a 50% payment as the transporter is climbing into his lorry. The DrumNet system will notify the farmer, and the bank that they are using, Equity Bank, will also notify the farmer that a certain size deposit has been deposited. Another main goal is to gather data about the reliability of all the actors in the chain. This data is primarily for the benefit of the farmer, as we can provide a type of credit rating. e.g. 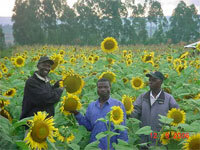 This farmer has worked with DrumNet for 2 years, and has very successfully planted and sold his sunflower every season. The participating bank(s) can then use that information to lower interest rates on their loans, offer different services like crop insurance, health care, education loans. This last part is extremely useful and could be used as the foundation for a reputation system for mobile banking in Africa. The potential there is that credit, and debt, can now be handed out at the micro-level to almost anyone. The banks who take an early role in this process, and those who are willing to venture into untested new territory with technology stand to gain a lot if they can create this mobile payments system for Africa. Great stuff – this could dovetail really well with Safaricom’s MPesa service as a means of processing the transactions involved from start to finish. We are hoping in future rounds to be able to transfer money directly to the farmers via in-bank electronic transfers, currently we only transfer to Self Help Group accounts. Through negotions with banking partners, we are aiming to get lower transactions costs than Mpesa. Currently MPesa is charging around 25 – 30 Kenyan Shillings a transfer. Though for the next few season farmers will probably have to use MPesa to transfer money or make a trip directly to the bank. Does anyone know if both parties have to be on Safaricom? Certain areas in the bush that we are working don’t have good Safaricom coverage and farmers are using Celtel instead. appreciate to know on the marketing and pricing of sunflower,capital outlay and ecological requirements. i have 5 acres of land not fully utilised . Am intrested in knowing how the value chain works in central and western region in kenya. Tell me how best to market 8000 kg of macadamia nuts in shell. I grow them in Meru. How can I get the latest prices and buyers? Is there any organisation in central kenya dealing with promotion of sunflower growing in the region and how would i get in touch with them? i would like to get info on how to do sunflower farming . we have a five acre piece that we need to implement the project by january 2009. kindly asisst and revert sonnest possible. I am a small scale farmer in Makueni District and I am looking for market for my farm produce. I have available cucumber and tomatoes will be ready by end of February. Other produces in my green house are red cupscum, manangu straberries and bricolli. I believe mine is a success story in view of the prevailing weather condition. P.O. Box 74648 -00200, Nairobi,Kenya. I am willing to deliver products (reasonable orders) door to door within Nairobi. Kindly assist with marketing. i realy like your idea in helping farmers improve their livelihood through.am more intrested in information systems and would be pleased if you gave me a chance to work with you . That an excellent innovation for the farmers,it will enable them to keep up to date with market information and avoid scrupulous middlemen. I am a small scale farmer in Kaiti Division, of Makueni District. I have interesting projects in our farm, namely:- Tilapia fish, greenhouse tomatoes, cucumber and capsicum. I have now planted Barbandensis Aloe Vera which will be ready for harvest by September 2010. I am looking for assistance in processing aloe vera products to the highest. standards. I have over 1,000 plants and I have women groups outgrowers. Is there someone out-there willing to undertake this project? I have all year round supply of kales,cabbages,capsocums,sweet melon,kienyeji eggs etc on my farm on Kisumu-Busia road.Interested in contracted supply. It a longtime since I pasted my comments/requests and not a single reply. Does this system work?! Please furnish me details on sunflower plantig for best seed, time of year2plant, best fertilizer, all info. Would like to do 3-5acres of land located 8km away from kakamega toward mumias. you should check out this website http://www.webarazafarmer.com for more information about farming stories and new farming techniques. its an online farming magazine in kenya. Hi fellow farmers, It is now raining heavily and time to plant and start new projects. I have available Aloe vera shoots for planting (medicinal barbadensis species) Book now to avoid disappointment. First 5 customers will get a good discount. you are doing great work for the farmers. We have customers in Africa who are farm owners. Farm drip irrigation kit is what we manufacture. Hope can service more people.